Davis Law Group is currently working with law firms across the United States to investigate and handle injury cases on behalf of women who have fallen victim to Johnson & Johnson’s dangerous products, including Johnson's Baby Powder. In the last several decades, women across the United States have experienced the dangerous side effects of using talcum powder. Many studies have shown even minimal exposure to talc — the main ingredient in talcum powder (baby powder) — can increase a woman’s risk for ovarian cancer. For many years, manufacturers ignored the risks of using talc. As a result, many women suffered due to this negligence. A talcum powder lawyer will fight for compensation on your behalf, and hold the manufacturer responsible. If you or someone you care for has been diagnosed with ovarian cancer or another form of cancer after using J&J’s talcum powder products, it may be in your best interests to contact Davis Law Group about a potential lawsuit. J&J’s Johnson’s Baby Powder feminine hygiene product contains talcum powder, which studies suggest can potentially cause an increased risk of ovarian cancer in women when the product is applied to the genital area. If you believe you have suffered because of talc, contact Davis Law Group today. Please fill out our confidential talcum powder lawsuit questionnaire. Johnson & Johnson has been aware for some time that its talcum powder products were potentially dangerous to consumers, yet the company never did anything to protect its customers from cancer and the other side effects that have surfaced. Internal documents from the company show that officials were growing concerned that the federal government might classify talc as a carcinogen, and they tried to find ways to deter the government from doing so. 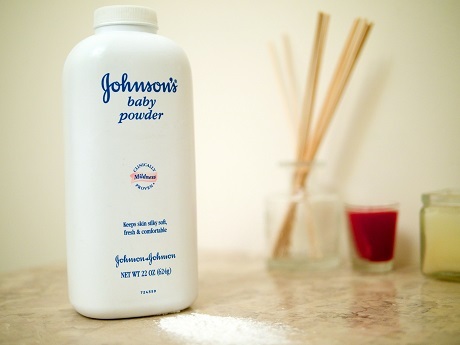 To this day, Johnson & Johnson maintains that products containing talcum powder are safe for every day use. This, despite the fact that researchers have found talcum powder molecules embedded in the diseased tissue of those who have died after long-term use. In October 2015, a woman named Jackie Fox died from ovarian cancer after having allegedly used J&J’s Johnson’s Baby Powder as a feminine hygiene product for decades. Those representing the victim filed a lawsuit on her behalf, alleging that Johnson & Johnson knew the risks of using talcum powder in its products but failed to protect the public from injury and death by continuing to produce and market the products. It was discovered that in 1997, a medical consultant wrote a memo to Johnson & Johnson officials explaining that anyone attempting to discredit a connection between talcum powder and cases of ovarian cancer is “denying the obvious in the face of all evidence to the contrary.” The memo was nearly 20 years old by the time it was made publicly available. A St. Louis jury recently awarded a $72 million verdict to the plaintiff(s) in this case, though that is likely to be appealed. The award included $10 million in "actual damages" and an additional $62 million in punitive damages, which is believed to be the result of the discovery of widespread fraud, negligence, and other egregious conduct by the company. The award-winning attorneys and legal staff at Davis Law Group are currently investigating injury claims involving ovarian cancer diagnosis in women who have used Johnson’s Baby Powder as a feminine hygiene product. We believe there is evidence to support a possible link between this product and various cancer diagnoses in innocent women who were unknowingly exposed to the dangerous side effects of Johnson’s Baby Powder. If you are an attorney and wish to discuss a potential association agreement with our office on one of these or another injury case, simply fill out the contact form on this page or call our downtown Seattle office at (206) 727-4000. Is Baby Powder A Safe Product For Female Hygiene? ?Can I file a lawsuit for ovarian cancer from talcum powder? ?Why is using talcum powder dangerous for women? Posted on 03/24/2016Is Baby Powder a Safe Product to be Used for Female Hygiene? Posted on 02/29/2016Is There a Link Between Talcum Powder & Ovarian Cancer?